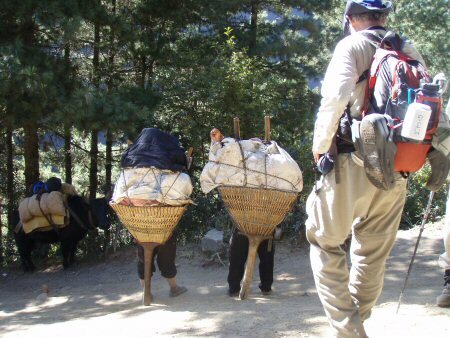 The trails were filled with porters, carrying goods up and down. We had our own porters, who carried our food, cooking gear, fuel, common area tents, our individual tents and sleeping pads, and our duffels. But most of the traffic on the trails besides trekkers were porters carrying goods for the lodges up and down the valley. Porters all carried loads on their back, on slings suspended from their head. I hate to think what this must have been doing to their neck vertebra. But they could hoist a truly remarkable amount of weight in this way. Most porters carried bamboo baskets filled with goods of one kind or another. The basket itself was about 3 feet deep, but often it was filled way over the top, so that the stack of good was six feet high or more, far bigger than the typical porter. The porters carrying heavy loads all have a peculiar kind of walking stick: a stout stick topped with a T. They use this to sit down on to rest. The porters rest often: from our point of view they are either resting (as we pass) or hurrying past us walking unreasonably fast, often cutting the steep switchbacks and going straight up the steep slopes. There are little sitting spots -- little benches constructed along the trail -- where the porters rest. We sat on these ourselves occasionally, but we usually tried to get up and let the porters sit there if they came by. We also tried hard to get out of the way as they barreled by, going up or down the trail. 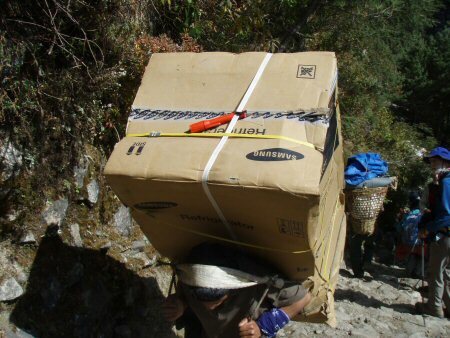 Because of their heavy loads, the porters were less able to maneuver than the trekkers. Two bags of rice, each marked 20 Kilos, being carried by girls that looked no older than 10. I presume these were being carried locally. A refrigerator in a box. At first, when I saw the refrigerator box, I thought it must be filled with something else, but no, it actually contained a refrigerator. I saw at least three refrigerators going by during the time we were there. Stacks of plywood: 4x8 sheets of plywood, thick stacks, that look like they must weigh 80-100 pounds, at least twice as large as the porters carring them. Beer -- cases of Everest Beer, filling the basket and stacked several feet above. I can hardly guess how much this must weigh. Kerosene: we saw lots of this going up the hill, and lots of empty containers coming back down. 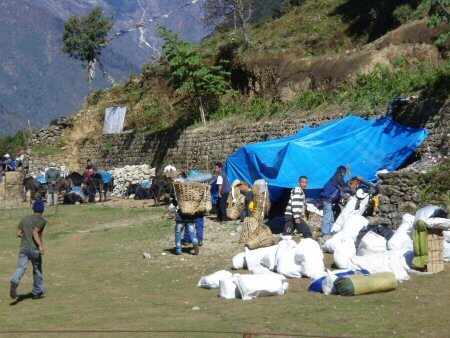 Although we flew in to Lukla, all our food and supplies and almost all our staff came in overland. This involves an 8 hour bus ride to Jiri and six days on the trail from there. And it is not a flat trail: there is one 14,000 foot pass on the way. This means, I guess, that is cheaper to carry something on a person's back for six days than to fly it one hour to Lukla. That's the price of labor.